Esbilac or Fox Valley (the first couple of feeds for a raw rescue should be rehydrating fluid, then formula can be introduced gradually). 1ml syringe, later (from about 3-4 weeks) 2.5ml or 3 ml syringe. Later still, when both you and the squirrels are confident about hand-rearing, 5ml. Small Catac teats (or similar). Birth to open eyes – every 4 hours, including overnight. Open eyes to weaning – every 4 hours, 5 feeds a day, not overnight. Open eyes to weaning – 5% of body weight, can slowly build up to 7%. Slowly from about 7 weeks till about 10 weeks; drop one feed every few days and make sure that the squirrel continues to gain weight from the solid food. Good weaning foods are Farley’s rusks, pine nuts, avocado. Never peanuts! 1.Inhaling the milk – this is very dangerous, a squirrel can die or get pneumonia; the younger the squirrel, the more the danger. Check that the milk is warm – not too hot or too cold. Check the position you hold the squirrel in – never on her back. She should be either upright or on all fours; experiment to see what your squirrel likes. Wrap the squirrel in a cloth and cover the face a bit to give her some feeding “privacy” – this is especially important for older babies. Check that the squirrel does not need to go to the toilet. You will know because the poo becomes lighter-coloured and soft. It is not good to over-load the digestive system like that, reduce the amount you feed. When the tummy feels round and hard. Either over-feeing, or insufficient toileting, or parasites. Should be done after every feed, stroke (but do not put pressure) on the lower tummy with tissue or cotton wool until you get results. Independent from about 6 weeks. Normal squirrel poo is in mustard-coloured pellets while they are on milk. Birth to 5 weeks – a small pet-carrier, blanket inside, blanket on top of the squirrels, on heat. The squirrel should always feel pleasantly warm to the touch. 5 to 8 weeks – bigger cage, but not a high one, in case the squirrels fall. Gradually reduce the heat. Blanket or nest, water, solid food, low things to climb on, things to chew. From this age squirrels shouldn’t be kept on their own, but in groups of 2 or 3. 8 to 12 weeks – big cage the squirrels can practise their climbing in. Leave the window in the room open to acclimatize them to outside temperatures. Nest, water, solid food, blanket or similar on the bottom to “dig” into, perches, things to chew. 12 weeks to release – big outside aviary with a nest box and plenty of natural objects to climb on and to chew. 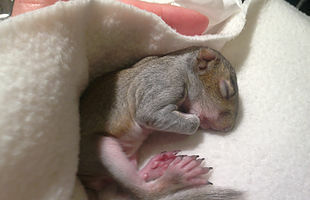 SOME HEALTH PROBLEMS – TALK TO EXPERIENCED REHABBERS AND/OR TAKE TO THE VET (no information sheet is complete without this section, but do not be discouraged – in actual fact, baby grey squirrels are strong animals who do their best to cooperate with your effort to save them). Pneumonia (rapid breathing, a clicking sound in the chest). Bloat that is painful or that is not helped by toileting more and feeding less. Any external injury that you can see. Fitting – do not ignore it, it can kill.